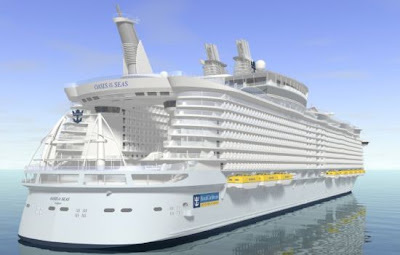 The captain of the Oasis of the Seas drove the 5,400 passenger cruise ship into Fort Lauderdale’s Port Everglades last fall, but it was Social Media channels that drove the Royal Caribbean’s cruise ship, the world’s largest, onto Google’s most-searched list. Travel trade publication Travel Weekly reported that as of a couple of weeks ago, 10 million unique visitors made their way to OasisoftheSea.com, and a whopping 200,000 people in a 24-hour period tuned in to watch videos of the Oasis captain, more viewers, said Travel Weekly, than Anderson Cooper drew on CNN in the same time period. It’s an axiom in Social Media marketing and public relations campaigns that the social web has an enormous capacity to bring mainstream media into the marketing and PR loop by generating deep consumer involvement in creating an on-line buzz, so that off-line media has to take notice, when they might ordinarily not. And the cruise industry apparently is getting this message. New York’s Weber Shandwick Agency which masterminded the Oasis media launch understands the social networking phenomenon well. According to Rene Mack, president of the lifestyle marketing department, Weber Shandwick wants their clients to be ahead of what he calls the dramatically changing media landscape. The Norwegian Cruise Line is also fully engaged, using Facebook and Twitter in to launch its largest-ever ship, the Norwegian Epic , and Holland America is timing its Facebook and Twitter campaign to prepare for its July 4 advertising campaign on why to sail Holland America. The cruise industry industry is well aware that only 18% of Americans have taken cruises. The non-cruising 82% of Americans is a huge untapped market and revenue source. And rather than rely on traditional approaches to reach them, cruise marketers have embraced a progressive approach that starts by building an on-line “cruise buzz”, leading to off-line media awareness, creating the perfect media storm of on-line, off-line conversion that Shandwick’s Mack calls “in-line media,” leading to the important conversions. In Royal Carib’s case, “engaging the audience” actually extended to letting the public name the Oasis through a contest with USA Today, giving the public a chance to “own” the ship, generating an enthusiastic base of future cruisers and cementing the existing loyal customer base. With 4,707 people following @oasisandallure on Twitter, and 500,000 video views from video sharing sites, the cruise industry is looking forward to smooth sailing and capturing a bigger market share through viral marketing. Been on a cruise lately?